Do you suffer from chronic aches and pains? Do you often get sore after your workouts? If so, you need this heating pad. 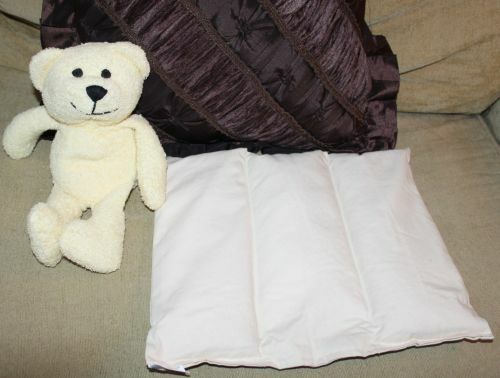 The Thermal Aid hot and cold pad is a wonderful alternative to pain meds. It is much better than a regular heat pack or cold pack in that it applies a moist heat therapeutic heat deep into the muscles and joints. Most heating pads don't do this. They are meant to reach only the surface of the problem and thermal aid goes deeper. I chose the medium size pad for my lower back and I have to say that it was indeed much better than my electric heating pad. I felt relief within seconds and it lasted a long time. I loved that unlike any heating pad i've used, it really does penetrate the muscles and I don't find that I have to "turn down the heat" because it gets too hot, like with the electric pad. I'm always having to fiddle with those settings. I also loved that I could carry it anywhere without worrying about how far the wire will reach, before it snaps out of the outlet. Need I tell you how many times I've tripped over the wire too? I also used it on my period cramps and it feels amazing. The only thing I don't like is the heaviness factor on that area, but it's not too bad. I used the teddy bear for my aching neck muscles I sometimes get from being on the computer too long and it also did the trick. The heat penetrates nicely. I also used the teddy as a cool pack and it is definitely so much better than a regular ice pack. You know ice packs can burn when you don't cover them with a towel and even then they get wet and messy. This is the answer to all of that. I love the teddy. Kids will especially adore this teddy when you are treating their bumps and bruises. They can cuddle with their teddy as they relax the pain away. I'm not ashamed to say I kinda cuddled with teddy on my neck. This is also a great alternative to my cat stealing my electric heating pad all the time. Every time I get up, there is the cat fake sleeping looking at me out of the corner of her eye. Now she can have her own. Let's face it though, she'll probably still steal mine anyway, because they think they own everything. Great aspects about the Thermal aid heating pad. It comes in 3 sizes to contour to each of your body parts perfectly. I chose the medium one for my low back. It also comes in a variety of fun animals! This pack sets itself apart from others in that it is 100% natural, made of cotton and a specially treated and processed corn product. The feeling of it is nice. It reminds me a lot of a beany bag , only bigger and heavier. The bear is similar to that of a big beany baby. Cooling takes about 5 hours in the freezer before use and lasts about 2 hours in use. Can be used for many reasons, including: arthritis, fibromyalgia, back pain, sprains/strains, muscle soreness, headaches/migraines, carpal tunnel, fever, menstrual cramps, lactation, babies with colic, leg cramps, multiple sclerosis, sciatic nerve pain due to pregnancy...and anywhere it hurts! Machine washable/dryer friendly or hand scrubbed and laid out to dry. Over all, I am thrilled with the hot and cold pack and would highly recommend it to someone as an alternative to an electric heating pad or regular ice pack. It comes very convenient size and lasts a significant amount of time. You can get the bear for only $19.95 and the Medium pad for only $30.95! The cost is amazing considering it's such a frugal product. It's easy to maintain and will last a long time if taken care of properly. * Please make sure to get this ok'd by your doctor, if you are very sensitive to temperature or you suffer from Diabetes, Nervous system disorders, circulatory disorders or other disorders that cause impairment of temperature sensation. And now i'm excited to announce that 2 lucky winners will get either a Teddy or Pad ! The teddy bear is perfect for boo boos on my kiddos, awesome! I definitely need to get that bear. Ok, make that 3, 1 for each kid. Especially since they seem to break all of the softer ice packs we get (I keep them in the fridge) & the hard ones are just too uncomfortable. I have a lot of back problems...this would be great on so many levels.